Pricing is for a case of 30 bulbs Sylvania 60 W T12 Cool White High Output Fluorescent Light Bulb - F48T12/CW/HO - Description: 60W, 48"MOL, T12 HO (800 mA) rapid start fluorescent lamp, Cool White phosphor, 4200K color temperature, 60 CRI. Average Rated Life (hr) - 12000, Average Rated Life (hr) 12000, Base Recessed Double Contact Bulb T12, Manufacture Sylvania. 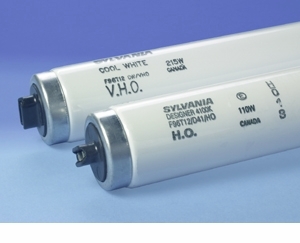 Sylvania 60 W T12 Cool White High Output Fluorescent Light Bulb - F48T12/CW/HO - Description: 60W, 48"MOL, T12 HO (800 mA) rapid start fluorescent lamp, Cool White phosphor, 4200K color temperature, 60 CRI. Average Rated Life (hr) - 12000, Average Rated Life (hr) 12000, Base Recessed Double Contact Bulb T12, Manufacture Sylvania.